Members Free Trade Union of Railway Workers of Ukraine (VPZU) were blackmailed, deprived of their bonuses, suspended from the job, evicted from the company-provided housing, and physically attacked. This story takes place in a European capital city — Kyiv, Ukraine. In April 2016 workers of the state-owned transport enterprise Kyivpastrans formed an independent union to fight against violations of safety standards . The administration responded with a refusal to recognise the union, pressure, threats and intimidation of the members of the union. This is completely unacceptable behaviour and the workers in Kyiv have asked for our support in an online campaign to put pressure on the local government to respect workers’ rights. In April 2016 workers of the state-owned transport enterprise Kyivpastrans formed an independent union to fight against violations of safety standards in the Kurenivske trolley bus depot. The administration responded with a refusal to recognise the union, pressure, threats and intimidation of the members of the union, which is affiliated to the Confederation of Free Trade Unions of Ukraine (KVPU). Union members were blackmailed, deprived of their bonuses, suspended from the job, evicted from the company-provided housing, and physically attacked. 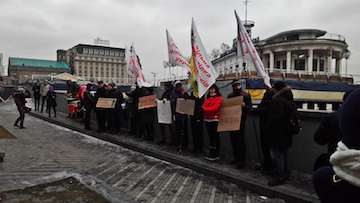 Help protect the independent union at Kyivpastrans by sending a message to the mayor of Kyiv.